Get in the game and show New York Jets team pride with our collection of mascots and insignias. National Football League TeamRugs™ are made of 100% nylon pile. New York Jets NFL team logo floormats are injected with colorfast dyes throughout to make them both durable and beautiful season after season. 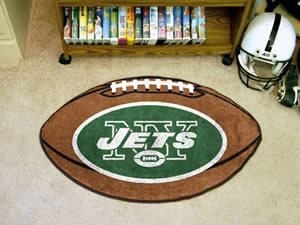 New York Jets NFL TeamRugs™ are perfect for use as an interior floor accent rug. A must have rug for every game room. Please allow up to 10 business days for your item to be produced & shipped. Vacum or spot clean with a damp cloth and brush off. Air dry. Not machine washable. Please Note: These Mats are custom made & therefore non-returnable.